Los Alerces National Park is a protected area located in the Andean region of the Province of Chubut, on the international border with the Republic of Chile. It has an area of 259,570 hectares belonging to the ecoregion of Bosques Patagónicos. 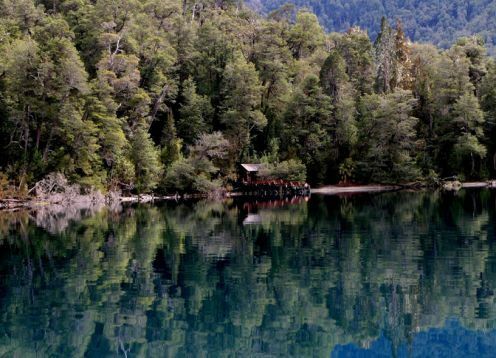 In the area there is a complex lacustrine system of numerous rivers, streams and water mirrors, which make up a system in which lakes Menéndez, Rivadavia, Futalaufquen and Krüger stand out, and the Frey river that drains into the Futaleufú hydroelectric dam ( Amutui Quimey reservoir). In April 1945, through Law Decree No. 9504, ratified by Law No. 13,895, several reserves were declared a National Park, including the Los Alerces Reserve, which, from that moment on, assumed the status of a National Park. .
On July 7, 2017, UNESCO (United Nations Educational, Scientific and Cultural Organization) declared a World Heritage Site to 188,379 hectares of Los Alerces National Park, of which more than seven thousand protect Millennial Forests of Larches. (Fitzroya cupressoides), with specimens that reach 2,600 years of existence.